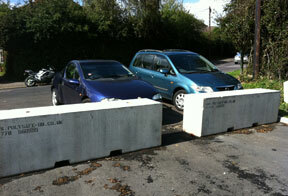 Polysafe products are ideal for creating concrete parking barriers. Polysafe concrete barriers are heavy enough that they cannot be moved by hand but are easily moved by forklift so you can have an incredibly strong parking barrier set up quickly. Whether you're looking for temporary barriers or a more permanent solution, concrete parking barriers give you a clearly defined parking area and ensure that drivers are confined to the areas where you want them to park (no sneaky moving of cones). Kerb style barriers can be used to section off parking areas, and also ensure lane discipline by stopping drivers driving diagonally across spaces. 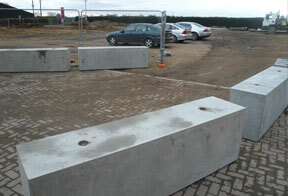 Polysafe concrete parking barriers are manufactured to the highest standards in a range of sizes and variations to suit your needs. Visit our before ordering and site preparation pages for advice on placing your order.